Cool mountain air caressing your face, mellow music complimenting the scenic beauty outside, friends to keep you company and an endless road to eternity; this is the stuff legendary road trips are made of. Summer is here, and there cannot be a better time to take a legendary road trip of your own. Sounds like a plan? Well then, all you need is an amazing destination and a cool car rental to make it happen… and guess what, we have got you covered. Check out these 5 destinations across the country where you can plan this summer’s most epic holiday. Located in the Parvati valley in Himachal Pradesh, Kalga is a quaint picturesque village. Anyone looking to relax in the arms of nature will instantly fall in love with this place. What one can explore nearby is a day-long trip to Kheerganga, drive down to Manikaran or chill music festivals in Kasol. Planning a road-trip already? 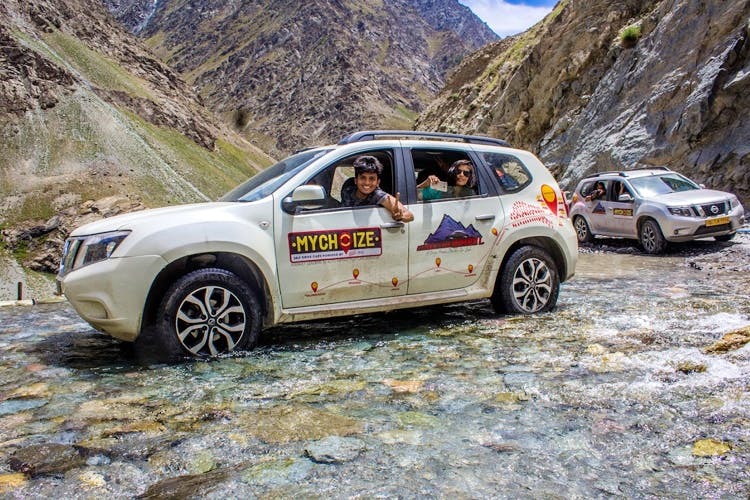 We suggest you book a car from MyChoize as they offer rentals on unlimited kilometers. What that means? You will be counting memories on the way and not the distance traveled. Gather your friends and book your ride here. Known by few, loved by all; located at the border of Maharashtra and Goa, and nestled between the Western Ghats, Amboli is a small little hill town which is both beautiful and calm. With waterfalls, sightseeing spots, great local cuisine and nice weather throughout, this lush-green spot is where a perfect road-trip with friends can be planned. If you are on our way to Konkan or Goa, we suggest you take a quick pit stop here. Be ready with your camera, as the place is full of Instagram-worthy shots. LBB Tip: If you are planning a road-trip, get on board the Self Drive Car Rental service from MyChoize Cars. With unlimited kilometers, doorstep delivery and pickup of the cars (even at the airport), all you have to do is apply for the office leave at the earliest. Book your ride here. In a search for a mini getaway but don’t have enough time or money on you? Take a trip to this beautiful Malshej Ghat barely 4 hours road-trip from Pune. The stop also doubles up as beautiful hill-station known for its serene climate and has attracted many families and friends for a short getaway. You can explore the hills or go on a fun trek, visit the waterfalls and much more. The natural setting of the place also adds to the unique charm of the place and which is why you must consider paying it a visit. Get your car rental from MyChoize Self Drive Cars right here, drive it at your convenience and have a fun weekend. Tired of the Bangalore traffic jams and want to escape to someplace calm and refreshing? Agumbe is your answer; situated in the Shimoga district in the Malnad region of Karnataka. Agumbe is known for its misty morning and serene weather and also known as Cherrapunji of South. You can venture out to explore the place or go have a quick drive to Kundari hills followed by the sunset which is pretty magnificent. Do take your cameras and capture the beautiful Jogi Gundi, Barkhana and Onake Abbi waterfalls that are close by to Agumbe. We suggest you stay there for minimum three days so as to embrace its beauty to the fullest. We got a rental car from MyChoize sorted right here giving you more privacy and freedom while you get your leaves sorted. Long weekends call for a long drive and Lava is where you should consider heading to. 14 hours scenic drive from Kolkata and 4 hours drive from Jalpaiguri is a hamlet called Lava, super popular for its hot springs and monastery. The place witnesses both families and backpackers who crave for a good getaway. Head to the Lava monastery to rejuvenate your soul or let the Changey & Tiffindara waterfalls relax you. They say sunsets in Lava are stunning and one must experience it live. So, call your friends and family and give them a heads up about this place. You can rent a car for this long drive from MyChoize right here. Self-driving would make you have a lot more fun while maintaining your privacy and also give you an extra seat which otherwise would have been occupied by a cab driver. Destinations are plenty but opportunities are few. The time is yours to go pack your bags, book your car and explore the world like never before. The car will come right at your doorsteps and you don’t have to worry about the kilometers traveled as the service comes with unlimited kilometers, what else are you waiting for? To stay travel-inspired and for more offers visit the MyChoize website or follow them on Facebook & Instagram.